One of the most challenging aspects of apartment (and tiny kitchen) brewing is finding a good, fast, and reasonable source for heating water and boiling wort at the apartment scale. So much so, it’s a constantly reoccurring question on most homebrewing forums (see long list at end of post). First time homebrewers often start their homebrewing adventures on the stovetop, but over time, many find it cumbersome, painstakingly slow, and/or insufficient for their homebrewing heating/boiling needs. 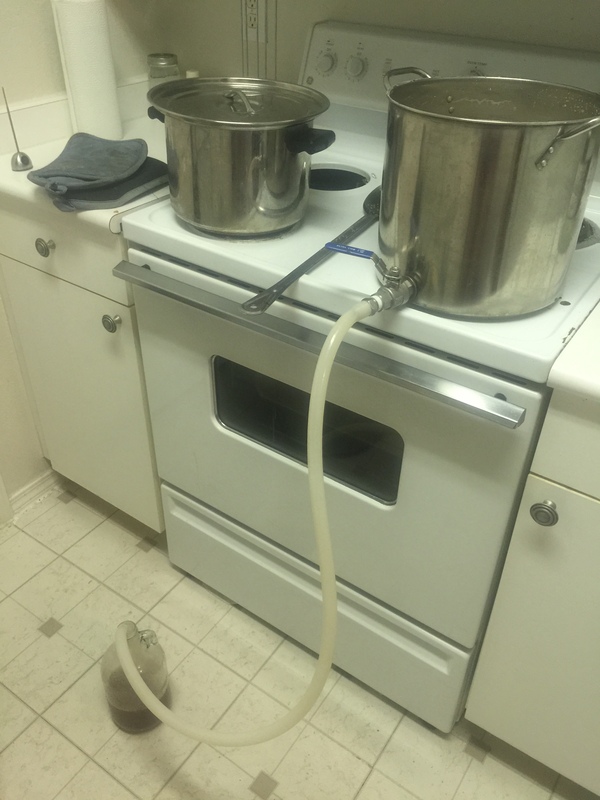 Thus, in this three part apartment brewing tech post, I detail many of the reported water/wort heating tips, tricks, and equipment commonly utilized by the apartment (and tiny kitchen) homebrewer to achieve suitable and sufficient heating for their homebrewing. In part 1 of the series, we’ll stick with stovetop as the primary means of heating, providing guidance on making the most of the stovetop (without modification) as a heating source in your homebrewing. Next, in part 2, we’ll explore easily acquired tech to improve/supplement your stovetop performance. Then lastly in part 3, we’ll go beyond the stovetop, discussing the variety of alternative means of achieving heating/boiling in your apartment brewing without going outside reasonable cost/space requirements of typical apartment homebrewers. Cheers and happy brewing! Quick note for the TL;DR reader: A listed summary is provided below! At the surface, this series may seem a bit overenthusiastic for only discussing technologies surrounding heating water and boiling wort at the apartment homebrew scale. In essence, I’m writing multiple posts about boiling liquids on a stovetop; “how boring is that!” you may wonder. However, when progressing through the variety of brewing techniques, the power/strength of your heating source and its rate/time to boil becomes compoundingly significant. For example, simply moving from a partial to full wort boil (approximately) doubles wort volume and thus (approximately) doubles your time to boil with a variety of heating elements (namely your stovetop) not supporting boils for large wort volumes (i.e. a full 5-6 gallon boil). Additionally, more advanced brewing techniques specifically using a mash/lauter all-grain system not only require a full volume wort boil but also heating hot mash and sparge water (in the 140-180 F range), making double duty of that stovetop. Bearing all this in mind, it’s easy to imagine that a weak/underperforming stovetop for your brewing process can become a large inhibiting factor in your progression through the hobby, adding unnecessary time and/or effort to the brew day, and hence the over-scaled (and somewhat silly) passion for heating water and boiling wort by stovetop and associated heating technologies. Now, onto the as-scheduled blog post! New to homebrewing? Just like keeping things simple? Perhaps, the stovetop is best space/cost saver in your apartment brewing? No worries! The stovetop as a whole can be a great heating source for your homebrewing, often just needing a few small adjustments to turn a slow/underperforming stovetop into a proper brewing-grade heating source. Thus, before going on a homebrew equipment shopping spree, consider the following relatively simple tip and tricks to improve your existing kitchen stovetop performance. Reduce Batch Size One of the easiest ways to utilize your stovetop for homebrewing is reducing your batch size below the typical 5-gallon batch. For many homebrewers this is a nonstarter, preferring batch sizes 5, 10, even 15+ gallon range in their homebrew process. However, for the apartment (and tiny kitchen) brewer, this is usually not a problem. Thus, if you’ve started homebrewing and are having trouble with your stovetop heating/boiling, consider reducing your batch size to a more reasonable level, usually a half batch (~3 gallons) is a great place to start. Most small apartments have a standard stovetops which easily handle 3-gallon batch boil (~4 gallons total) without much modification (unless you lived in my ~380 sqft efficiency when I lived in Houston for 4 months where couldn’t even fit a standard sized frozen pizza, but that’s a story for another time). Also, as an added bonus, utilizing smaller batch sizes for faster boils will also yield you less trouble and time elsewhere in your homebrew process, for example quicker chilling times, less yeast required at pitching (perhaps allowing for direct pitching of liquid yeast), and less homebrew to bottle/keg come packaging, etc. Cheers to that! Split the Boil Another stovetop tip/trick is to split up a batch into two (or more) smaller boil batch sizes using multiple kettles and burners (essentially two is better than one). Using this technique, you should achieve a much quicker boil by breaking a batch into two smaller portions (for example a 6 gallon boil into two 3 gallon boils). Splitting a boil can be used merely to reach/sustain a boil (then recombined into a single brew kettle or can be utilized in more complicated processes. For example, I regularly use this technique during the batch lauter/sparge process I employ with my all-grain brewing. Once the first runnings are collected, I start their boil on the big burner in my main 8-gallon kettle while I start the sparge process. Once the second (even third) runnings are collected in a second kettle, I get them also up to a boil on a secondary burner. Once both begin to reach a boil, I recombine them into the (first) main kettle. The split boil overall saves some time on the way to a full boil especially since by big burner has trouble reaching a boil with large batches (although no problem maintaining it). Put a Lid on it (with caution!) Employing lids with brew kettle is a mildly controversial topic in homebrewing, but can serve a useful purpose in select arenas to help better achieve heating/boiling on your stovetop brewing. This really doesn’t require much explaining, but in essences, a covered pot reduces convective and other forms of heat transfer by covering its opening (much like you head in the cold winter months with stocking cap), making heat/boiling more efficient than an uncovered pot. Thus, when appropriate, a lid can make your heat/boiling on your stovetop a bit more easily achieved. 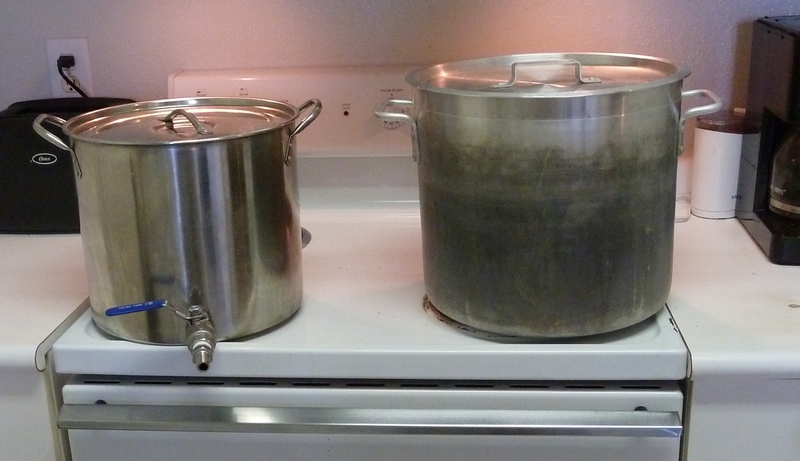 Why shouldn’t you keep boiling wort under a covered lid (like boiling pasta for instance)? The main concern is two-fold. First (you may already know this), but when wort boil is first achieved, wort will undergo hot break, a mass of protein/tannin coagulation which often results in a (sometimes large) foamy head for the first few minute of the boil. A lidded brew kettle at this stage would only allow the hot break to get even larger than without it covered but also (most likely) not inform you of its growing presence, both of which is readied for a boilover (and the start of a brew day disaster). Keeping the kettle uncovered during the latter parts of reaching a boil helps mitigate boilover disasters (assuming even an uncovered kettle is being watched of course). Secondly (mostly related to all-grain brewing), the standard 60-minute boil not only helps isomerize alpha-acids in hops (creating bitterness) but also off-gasses volatile off-flavor forming compounds, namely DMS precursors throughout the boil. While a covered boil may be more efficient, it also traps these precursors from escaping out the top, thus potentially producing a beer with less than desired DMS off-flavors (cooked corn/celery, sometimes shellfish-like), which are generally not desired in large qualities. Thus, keeping the lid off or at least only partially covered helps reduce this potential off-flavor dilemma. Next up in the series, in part 2, we’ll beef up your stovetop brewing with some extra tech, namely a look at kettle insulation and supplemental heating power via electric heat sticks. After that, in part 3, we’ll go beyond the stovetop looking into alternative burner tech on the market many especially designed with apartment (and tiny kitchen) brewers in mind. What tips and tricks do you use your stovetop apartment brewing? Leave your experiences in the comment section below. As always, cheers and happy brewing! note: just a select few of very very many; cheers! Thanks! That’s a really good and interesting question; not sure though. I’ve used both Al and stainless kettle and haven’t seen a big difference between the two materials in terms of bigger batch sizes and boils (although I think Al may be a bit better). Tall vs. wide may have a bigger impact. Since heat escapes out the top of the kettle, a narrower pot would likely have less heat transferred and thus reach a boil better than a wider kettle. However, since all my brew kettle are wide, I can’t personally verify this. Looks like more research is necessary. Best luck brewing (and the bigger batches); cheers! Interestingly, I prefer to do 3 gallon batches if only because I get a quicker turnover of beer meaning I brew more often but can try out more recipes and styles. My kitchen gas stove can manage up to 5 gallon brews – but not much more! Agreed and agreed! My stove can handle a full 5 gallon boil, but I often prefer small batches for experimentation and recipe development. Cheers and happy brewing! I’ve thought about writing a similar blog from an apartment brewer’s perspective. What has worked well for me, including some of what you wrote out, is going down to 1-2 gallon BIAB. There’s definitely a sweet spot between being able to try a bunch of recipes and not being able to keep up with brewing enough volume. 1 gallon is not quite there, but going that small allows for easy, weeknight brewing. Nice; definitely go for it! Also, agreed. I initially started AG brewing in my apartment using 3 gallon BIAB for about a dozen batches before transitioning to my home-built (or should I say apt-built) MLT system pictured above. You’re welcome to post a link in the comment section here. Cheers and happy brewing! Have you considered one of the electric home brewing systems?